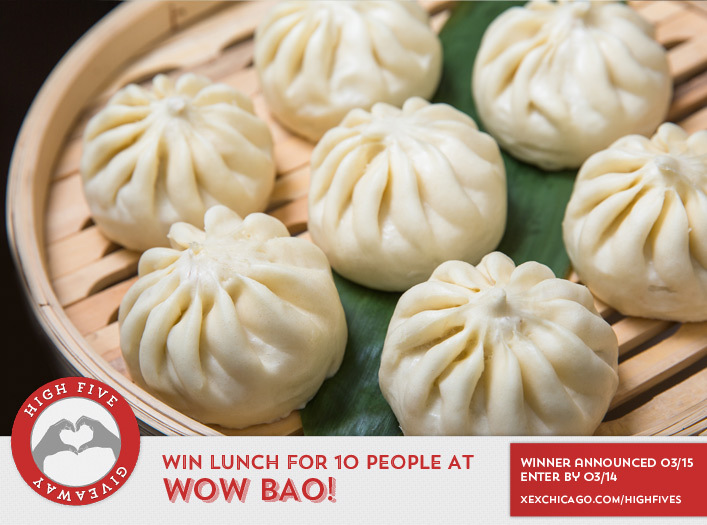 Win Lunch for 10 People at Wow Bao! Congratulations to Cynthia Lasky on winning our 174th High Five Giveaway! Thanks to all who entered. For our next High Five Giveaway we are giving away lunch for up to 10 people at Wow Bao (a $130 value)! What is the name of the building that XEX is located in? It’s named after an advertising agency! Hint: Check our the “location” section at the bottom of our site for the answer. Now, just add a comment to this post with the right answer to be eligible to win! The winner will be announced on Wednesday, March 15. Enter by midnight on Tuesday, March 14. And it was Leo Burnett who unfortunately won’t be able to make it for lunch. Love Wow Bow and would enjoy hosting a gathering of friends for a delicious lunch. It’s the Leo Burnett Building! It’s located in the Leo Burnett Building! Thanks so much for doing this contest! !